On March, 2010, in Language, Learning, tools, Uncategorized. 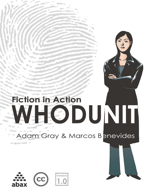 Adam Gray and Marcos Benavides have collaborated on a textbook of mysteries for language learning called Whodunit. Published by Abax, this is one of the first creative Commons textbooks available. You can download it and pay what you think is the best price (shades of RadioHead or Pearl Jam). After reading through the very interesting mysteries, I decided I would use it in 3 of my classes. I am most curious as to how it works in an average class in japan (at ShowaELC) and how it is different from my exceptional students and University of Tokyo. Will keep you updated, but this looks like a great text out of the box, easy to use and thorough. The paper edition comes with additional audio to round out the experience. I am going to have my students use both versions (paper and pdf), so they can get the entire experience. I will be adding supplementary materials to my Moodle on this topic as well, with 2-minute and 5-minute mysteries, and a tutorial on how to write a mystery. So how did it go? Have you gotten your hands on the print edition?